The western end of Cockenoe Island is seen here from the north shore of the island. The C. J. Toth approached Cockenoe Island on an overcast Sunday afternoon. On board the ferry was a group armed with binoculars, baseball caps and cameras with long lenses, all pointed toward the shore. The sweet smoky smell of breakfast wafted toward them from a campsite on the island, but that’s not what had caught their attention. “There!” said Larry Flynn, a master wildlife conservationist at the Norwalk Seaport Association. A great egret flew overhead and landed in a tree, where its nest was hidden. The boat circled around to the side of the island facing the shore, where yellow-crowned herons, willets and a glossy ibis stalked through the grass. Crows sat on a sign staked in the shore and watched a terrapin turtle race away with surprising haste. The island is now a haven for campers and birds, featuring one of the only colonies for long-legged waders in the state. But in the past, it’s been sanctuary for much more, from chickens to illegal spirits. 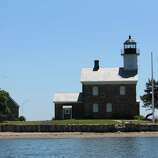 Like all of the Norwalk Islands, Cockenoe has a long and storied history, both legendary and factual. 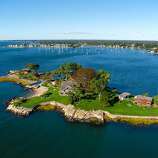 The island is named after Cockinsecko, a native American who was captured in the Pequot Wars and learned to not only speak but also read and write English. While Eliot does not name the Native American he’s referring to in his letter, historians believe it was Cockinsecko. Cockinsecko’s English allowed him to serve as an interpreter, and he was one of several people who signed a deed to land in the area in 1651. 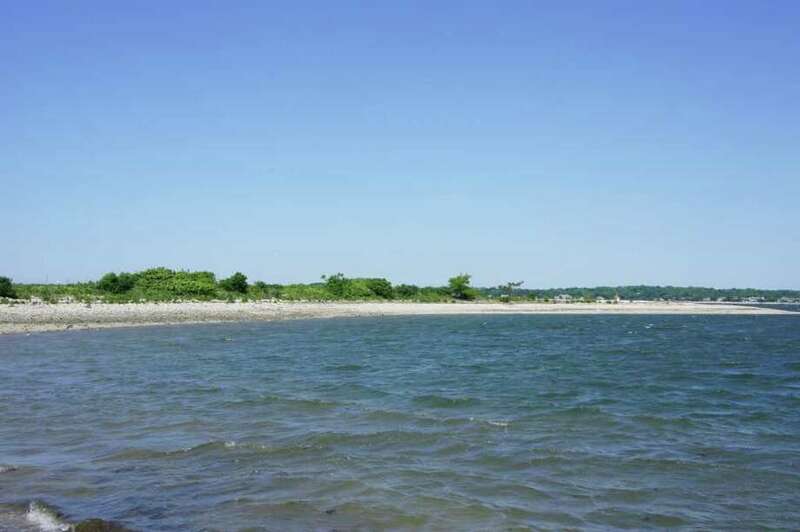 After the native Americans lost the island, it’s use was largely transitory — for example, some say Captain Kidd used the island to hide a chest of pirated treasure (a claim made of other island along Long Island Sound). It wasn’t until the beginning of the 19th century that Gershom Burr Smith and his brother, Hezikiah, moved onto the island permanently to farm corn and raise cattle (it was less than ideal for the purpose, with some of the cows meeting their watery demise in the Sound). The Smiths left the island before the Prohibition, when the Norwalk Islands became a notorious haven for rum runners. Cockenoe had an advantage over the other islands — at the time, it was connected to the mainland by a land bridge at low tide. A band of Southern moonshiners used this to their advantage, according to a history by Jeff Bolster, shuttling barrels of liquor and molasses by ox cart in the dead of the night until the federal government raided the operation. After spirits, people tried raising horses and chickens on the island before United Illuminating finally proposed an atomic power plant there. Many in Westport were incensed, and after a battle, the town wound up purchasing the island, which it owns to this day. That day’s boat tour swung by a sandbar covered in terns, piping plover and oystercatchers, a bird with a bright orange beak that specializes at getting at bivalves. The bar, which is quickly eroding, is perhaps the last remnant of the land bridge that once connected the Cockenoe to the shore. “In 20, 30 years, this won’t be here, so remember,” Flynn told the passengers. The tour also swung by Goose Island, a sandy stretch of 3.4 acres on which crowds of birds could be seen even from afar. 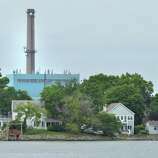 “This is probably the biggest breeding ground for double breasted cormorant in the state of Connecticut,” Flynn said. There are up to 400 nests of the black, catlike birds a season. Many grouped on a stone structure, the remnants of a stone building that had been used as part of a study on rat populations before being destroyed by Hurricane Sandy. On the western side of the island, great black gulls stood alongside their chicks, tan puffs with a jerky steps and untried wings. That’s why a place far from disturbances is so important for the rookery. “Listen,” Flynn urged passengers. All that could be heard was the water and the wind. For centuries, that’s been the allure of the islands to human and birds alike.